Use code thesparkledlife to receive 15% off!! 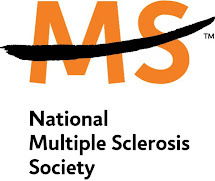 Since being diagnosed with Multiple Sclerosis 6 years ago, I have found a new appreciation for my teeth. So I take good care of my teeth. Whitening my teeth has always been something I've done before a big event or just to give myself a little self-care love. I've used teeth whitening gels from CVS and more often, crests whitening strips - both of which I loved. 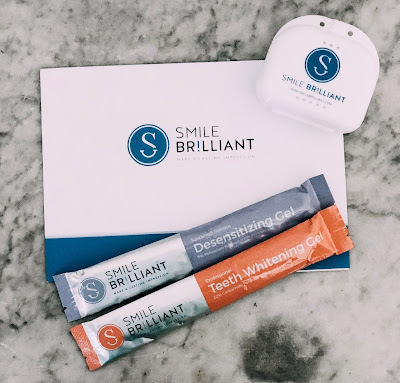 So when Smile Brilliant reached out to me for a collaboration, I was 100% on board. A cute white and blue box arrives with all the instructions you would ever need. There are also videos online you can view as well. First step is to make your impressions. You do this by mixing two clay like products, putting them in a retainer, and pressing your teeth into them. They then harden. Ship these back to the lab. 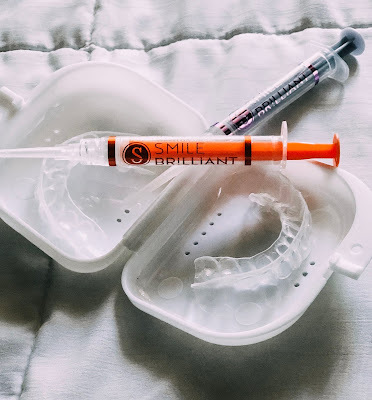 The lab receives them and they literally make a plastic mold that fits exactly to your teeth. Meaning, you get in to all the nook and crannies! Once you receive your custom fit impressions you can start the whitening process. It's two stepped. First is the whitening gel; you line the impressions with the gel and slide those babies on. You should wear them for 45 minutes but can wear them up to 3 hours for max results (I wore them for about an hour). After whitening you brush your teeth. Then follow up with the desensitizing gel. This is what I liked most about the process. It sort of calms your teeth sensitivity down after whitening. You do the same thing, line the impressions with the gel, and wear for 25 minutes. And tada - now you have sparkling white teeth! How babe and easy is that? 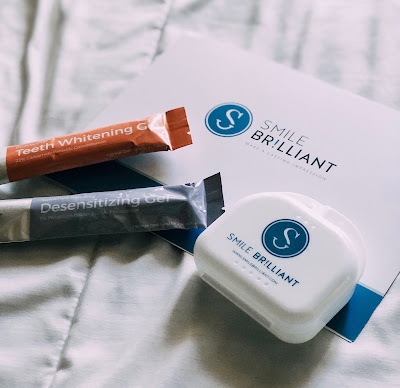 You can find out more about Smile Brilliant and look into getting a teeth whitening kit for yourself. Use code thesparkledlife to receive 15% off! !